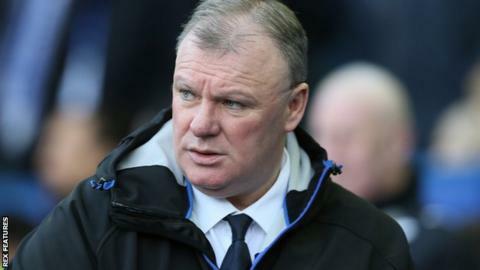 Leeds United head coach Steve Evans has criticised the referee after his side had a goal disallowed during their 2-0 defeat at Sheffield Wednesday. Liam Cooper's header was ruled out by Anthony Taylor because a substitution had not been completed. "I've never seen anything like it in my life. It can only happen at Leeds," Evans told BBC Radio Leeds. "It's a real shame, it's such a horrendous decision from what is meant to be a Premier League referee." Sheffield Wednesday striker Fernando Forestieri was leaving the pitch when Cooper bundled in a Leeds corner. Taylor initially allowed the goal, but reversed his decision after speaking to the other match officials. "The boy in the middle of the park for Sheffield Wednesday was taking forever to come off," Evans said. "The referee clearly whistles and shouts to the players to play, and gives the goal. "He pointed to the halfway line and gave the goal, then the Wednesday players got around him and he changed his mind." Leeds have won one only of their last six league fixtures and have slipped to 17th place in the Championship, just eight points clear of the relegation zone. "I thought the performance deserved to win a game, but we didn't get a chance to put Wednesday under pressure at home," Evans added. "I've never seen a game where the referee starts open play, you score a goal and he decides to take it back. It's a one-off."